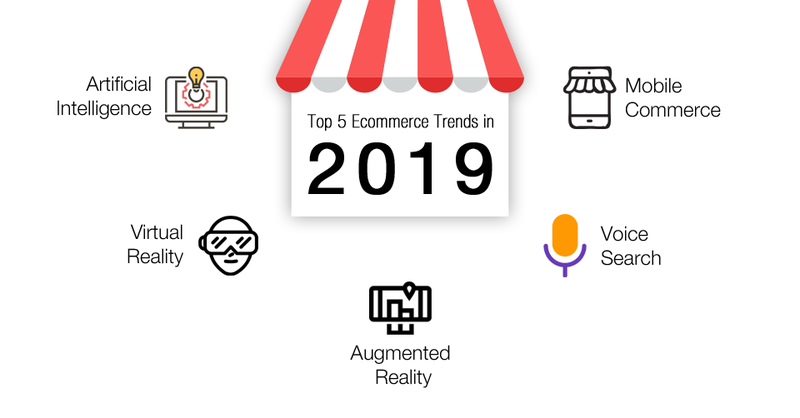 5 Top & Important Ecommerce Trends – Need to be considered in 2019 – V Group Inc.
Is your ecommerce business ready for new challenges? Recently ecommerce marketing strategy has experienced rapid growth in 2018-2019. According to the Shopify update, smartphone users have rapidly increased in ecommerce sector. Artificial Intelligence (AI): This is a very well-known emerging technology. The future of advanced ecommerce is to boost the custom visual experience, provide 3D animations, chatbots, send automated engagement emails and responses based on customer interactions and information, improve customer recommendation based on their interest and many more features. AI helps you to build your own ecommerce strategy and manage your customers very well. It is largely expected that the advanced ecommerce services based on AI would be offered by various platforms this year. Don’t believe the myth the investment in AI is too expensive and complicated. A large number of businesses are already using the AI technology. Virtual Reality: VR technology adds a new level of user experience to the online shopping experience. This platform offers customers a virtual experience which is like browsing through a physical store with detailed information about products. This is the best technology for businesses and gives the customers the chance to visualize a product and how it looks before they purchase; it is like “Try before Buy” for customers. Augmented Reality: AR is another technology growing rapidly in the market and expected to reach a USD 120 billion mark by 2020. The growth in consumer demands, evolution of smartphones and tablets, and market capabilities leads to a strong trend that makes AR one of the major tools in the ecommerce world. Augmented reality can be experienced through your phone, on your computer or even special augmented reality glasses like Google Glass. Augmented reality ecommerce allows you to make purchases on your mobile device or desktop. Voice Search: Nowadays, voice search is becoming more popular in ecommerce market and it will replace “Actual Typing” because people do not want to spend the time to type entire query and then search. Therefore, the ecommerce website should be voice optimized as well. Most of the top companies add voice search feature/ assistance like Apple Siri, Google Voice Assistant and Amazon Alexa. Google highlighted that more than 20% of mobile queries are voice-based and this will only grow by 2020. Mobile Commerce: According to researches mobile commerce sales is expected to account for 54% of total ecommerce sales. Mobile commerce is also called as M-Commerce, it is the advanced version of ecommerce for mobile devices so people can easily buy and sell products and services using mobile and tablet devices. Mobile shopping is a most advanced level of shopping experience and it is possible because of mobile optimize websites and dedicated apps. The overall scenario of Ecommerce industry is going to change in upcoming years and most of the store/business owners want to update their site with latest technology trends and that’s why they are reaching out to ecommerce web development companies for advanced level of changes in their store.